Karate means “empty hand” and dō means “path” or “way”. Therefore, the literal translation of karatedō is “the way of the empty hand.” However, karatedō can be considered more than just a way of combat or self-defense, and for the serious karateka (karate practitioner), karatedō is a way of life. Although karate may appear as only an outward expression of power, the practice of karate will also develop inner strength of character and promote spiritual development of the karateka. Lessons in karatedō have the potential to extend beyond the dōjō, to permeate and improve all aspects of everyday life. With dedicated and consistent practice, that karateka will follow their own unique path as they discover their own Way. Renbukai karate is a traditional style of karatedō that literally translates to “the association to forge the martial way”. Renbukai does not have one single founder in its history. Instead, over time, it developed into an organization of martial artists of varying disciplines. Eventually it evolved into the practice it is today; Renbukai integrates all aspects of karate practice, but is a unique system in that it developed and utilizes bōgu (armor) to allow for a more realistic approach to training and competition. Renbukai is an ideal blend of tradition and practicality in karatedō. The exact origin of the martial arts remains uncertain. Lacking in historical evidence, details of the growth and spread of the martial arts have often been derived through myth and speculation. However, fragments of information suggest the martial arts began to develop in the ancient civilizations of India and China sometime between the 5th century BC and the 3rd century AD. Believed to be largely developed under Buddhist influence, over time the martial arts were introduced into popular Chinese culture. Eventually, through trade and commerce, these arts found their way to the small Pacific island of Okinawa. 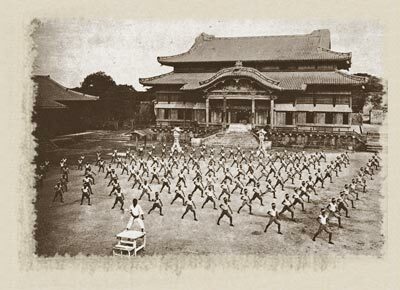 As with all styles of karatedō, the roots of Renbukai can be traced back to the traditional martial arts of Okinawa – Shuri-Te, Naha-Te, and Tomari-Te. These empty-handed arts were first practiced and shrouded in secrecy, in response to a ban on weapons enforced by the Japanese oppressors who first conquered the island in 1609. Nearing the end of the 19th century, these arts began to be practiced more openly, and were eventually integrated into the Okinawan school curriculum at the turn of the 20th century. It was around this time that the then future Emperor of Japan visited Okinawa and witnessed a demonstration of what is now commonly known as karate. Impressed with what he saw, he invited leaders of karate to travel to Japan to teach their art. Karate was introduced to Japan in 1922, and subsequently spread worldwide in both the original Okinawan forms and slightly modified Japanese methods. As the growth and spread of karate in Japan continued, some practitioners began to search for new ways to practice as they felt that elements of practicality were lost in teaching. In particular they sought ways to develop the aspect of kumite (sparring). Kumite was typically practiced non-contact (sundome), and in some instances, omitted entirely. Seeking new ways to develop this aspect of practice, advanced practitioners from various styles began to meet to exchange ideas during the 1930’s and 40’s. Eventually, the use of modified bōgu (armor) from kendo (a martial art of Japanese swordsmanship) was implemented. This allowed practitioners to use techniques to their full capability, but still protected them from unnecessary harm. In 1940 this new style was recognized as Kanbukan, and over the next couple of decades it continued to evolve, with many influential and famous karate practitioners of various disciplines contributing their ideas and expertise. In 1951 the name Kanbukan was changed to Renbukan, and in 1954 the first full-contact competition using modified bōgu was held. In 1964 Renbukan became Renbukai, which translates “the association to forge the martial way”. At the same time, the All-Japan Karatedō Federation was formed, which Renbukai joined, along with six other major styles of karate. Although it is less well known, due to its lack of English speaking leaders in the organization, Renbukai continues to grow, evolve, and spread across the globe today. Please contact us anytime for more information on karatedō or Renbukai karate, or to schedule your free karate classes to give us a try!